Big Society, yes. No Society, no! A recent detectorists’ newsletter says the Portable Antiquities Scheme is “the largest Community Archaeology Project the country has ever seen”. PAS often says so, many institutions repeat it and it has even been stated in evidence submitted to Parliament. 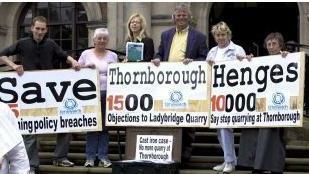 Amateur archaeologists don’t get money from the taxpayer or remove or sell that in which they are interested. Nor have they been dubbed heroes by a previous culture minister. Nor has the current culture minister recently been photographed “trying his hand” with them – like Ed Vaisey has recently at a metal detecting club. (It was pasture Ed, was that a wise photo-op? And did you realise their Code of Conduct doesn’t require members to report to the PAS but like all the other clubs uses a get-out clause – “acquaint yourself with current NCMD policy relating to the Voluntary Reporting of Portable Antiquities” – i.e. if you don’t want to record, that’s OK!). It’s so easy to distinguish true amateur archaeology from the faux variety. It’s NOT how much you say you love the past it’s whether you lay personal claim to it. For true amateur archaeologists there are NO POCKETS NEEDED! All else is bluster, and if someone turns up at your farm gate covered in pockets and pouches they’re not amateur archaeologists. Simple. Surely other archaeologists and institutions shouldn’t support PAS’s claim to be the country’s main Community Archaeology Project, particularly right now? 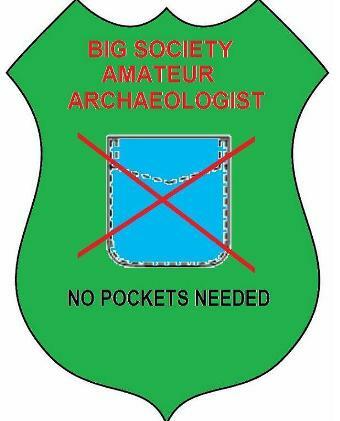 Isn’t there a danger that the government will find it convenient to present Archaeology in the Big Society as a dumbed down acquisitive activity – a Thatcherite Big Grab Society, devoid of any pretence that the society that is being bigged up even exists. Why else did Ed Vaisey visit that metal detecting club??? Much better for CBA, EH, NT et al to say to government: “If you have enough dosh to spend £1.5 million a year on PAS, maybe in fairness you could set up another body to balance things out, a quango to promote genuine amateur archaeology. It wouldn’t cost much as they wouldn’t need encouraging or persuading to do the right thing. 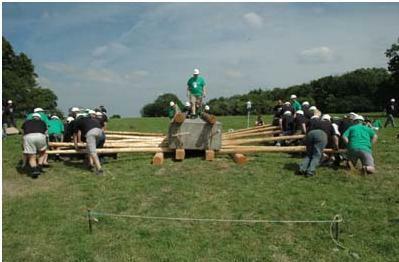 If the government says the Big Society requires lots of volunteers let them all be deserving beyond dispute.